The Eastwood Funeral Partnership is an Independent Family business which can trace its origins back to the Victorian era. From the 1800s to the present day we have been serving families from Nottinghamshire and Derbyshire, growing our territory with each new generation. In 2017 we are celebrating the 150th anniversary of the establishment of the business. 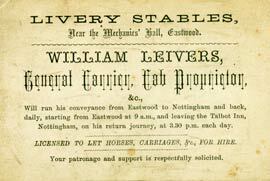 An original business card, which is on display at our Eastwood office, shows that in 1867, the Leivers family started the ‘Star Livery Stables’ in Victoria Street, Eastwood, next to what was to become the birthplace of the author DH Lawrence. 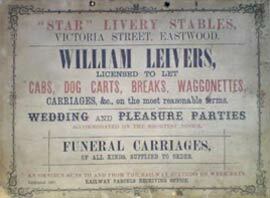 By the 1970’s, the business had progressed from supplying vehicles to local ‘Undertakers’ to providing a complete Funeral Service, and was renamed Eastwood and District Funeral Service. In 1983, the business moved to its current location on Nottingham Road. 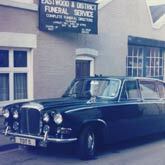 Our Stapleford Funeral Home, established in 1986, was the Partnership’s first branch office. Originally at Carrara House on Cemetery Road in Stapleford, it was managed by Stuart Edwards until his retirement in 1998. In 1997, the business moved to the current much larger premises on Derby Road in Stapleford. 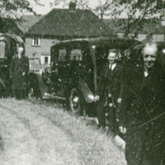 Originally named Stapleford Funeral Service, this branch was renamed Gillotts Funeral Service to mirror its sister branch in Heanor and to strengthen its identity as an independent family business. 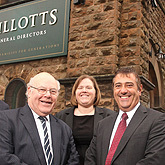 In 1992, John Gillott, known as Jack, the proprietor of Gillotts Funeral Service, a long-established family business in Heanor, decided it was time to retire, and the Partnership purchased the business, which operates at Abbott Street, Heanor. Anthony Topley, Jack’s Son-in-Law, who had been in Partnership with Jack since 1986, joined the Eastwood Partnership. The original property was demolished, and purpose-designed premises were built to provide modern, high-quality facilities. In 1997, the Partnership took over the premises at 35 Main Street, Kimberley, which has allowed the Partnership to extend the Services provided to families in the Kimberley, Nuthall and Watnall areas. In November 2015, the Kimberley Funeral Home moved to new premises in the former Methodist Church at the corner of Main Street and Broomhill Road in Kimberley. The move to new premises in Kimberley, and the prospect of a new funeral home in Selston the following year meant that the visual identity of the business, with three different trading names, has to be addressed. To coincide with the opening of the new Kimberley premises, all four of the Partnership’s funeral homes were renamed ‘Gillotts Funeral Directors’, uniting under the last family name from our history to sit above the door. In May 2016 the Partnership’s fifth funeral home in Selston opened its doors. The business has four partners; Barry and Elaine Hutsby, their daughter Joanne, and Anthony Topley, who are assisted by qualified Funeral Directors Alan Winfield and Helen Ellis. Barry and Elaine’s younger daughter Alison also works at the Eastwood funeral home as office manager. Whilst the business as a whole has grown and changed, each funeral home remains an integral part of the town and community it serves, offering a friendly and caring service, ensuring that all of its clients receive their full attention to ensure that their needs are met.